OREP – Organization of Real Estate Professionals, specializes in Errors and Omissions and General Liability Insurance for home inspectors nationwide. The E&O and General Liability insurance provided by OREP for home inspectors is Admitted (no surplus lines taxes). Most home inspectors qualify for OREP’s E&O insurance program, which inspectors can use to select their coverage and submit their application for quoting in less than 5 minutes. OREP’s E&O insurance application allows you to get back to work in minutes! Home inspectors no longer have to go without coverage or pay extra for full coverage. OREP offers broad coverage at low minimum premiums that include Errors and Omissions Insurance and General Liability. Coverages available include radon, pest, commercial, FHA, HUD and VA Inspections (Including 203K), prior acts (for qualified applicants), agent referral, additional insured (franchises), pool and spa, mortgage field, energy rating and many other services. Premiums start between $1,000 to $1,250 for OREP’s base policy. OREP is committed to providing quality home inspector errors and omissions insurance policies that protect you and your business! 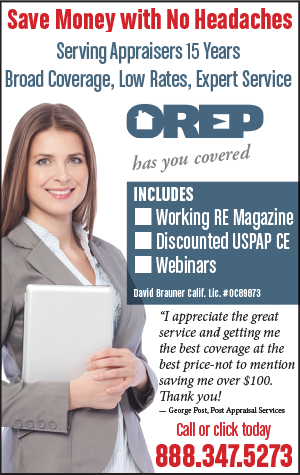 OREP also provides approved low-cost continuing education for home inspectors, corporate pricing on goods and services (save a bundle) and award-winning Working RE Magazine as part of its benefits package. 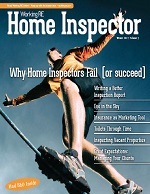 Working RE for home inspectors is a publication that provides content aimed at keeping home inspectors informed about the latest news in their industry. Read below for Working RE stories for home inspectors and home inspector insurance topics. These articles are filled with advice and tips on how home inspectors can limit their liability and protect themselves and their home inspection business. Cutting Expenses as Business Slows: Why Canceling Your E&O Can Really Cost You! Click here to explore more articles and Working RE coverage of Home Inspector Insurance.